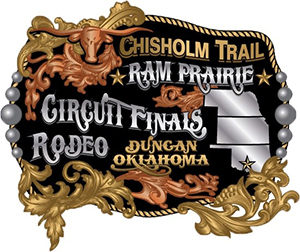 DUNCAN, Okla. – The Chisholm Trail Ram Prairie Circuit Finals Rodeo is more than an event. It’s more than a championship. It’s more than the very best competitors from the Oklahoma-Kansas-Nebraska region that earned the right to be in the field. “We want this to be a great championship for all these great cowboys and cowgirls, but there’s more to it than that,” said Joe Henderson, chairman of the volunteer committee that produces the event, set for 7:30 p.m. Thursday, Oct. 20-Saturday, Oct. 22, at the Stephens County Arena in Duncan. That includes a couple of nights to celebrate the community. The performance set for Friday, Oct. 21, will be Tough Enough to Wear Pink Night, which raises awareness toward the fight against cancer. With October being Breast Cancer Awareness Month, it’s only fitting that the rodeo will have a night just to bring attention to the fight against cancer. While organizers hope fans will show up donning pink, they also have similar sentiments for the final night of the rodeo with blue attire. “With everything going on in our country regarding attacks on police, we are focusing Saturday night as ‘Respect the Blue Night,’ ” Henderson said. “We are inviting local law enforcement officers, members of the fire department and EMTs to join us for that night. Community is behind everything the Chisholm Trail Ram Prairie Circuit Finals Rodeo Committee does. Made up of local volunteers that dedicate many hours to the rodeo, the key factor in organizing the championship is to bring hundreds of people to Duncan for a few days in October. “We will have more than 100 cowboys and cowgirls that have qualified to be in Duncan that weekend,” Henderson said. “When you include their families and friends, we have several hundred more that will come to town. That means we have that many more people fueling at our gas stations, eating at our restaurants and staying in our hotels.